It’s Not About The Parking Spot | George. Jessie. Love. I admire your courage and honesty. I could learn a lot from you. Thank you for letting me in! I also like you for your honesty and courage to “just say it”! Things are getting better for you..
Hi Julie, I began following your blog quite awhile ago to keep up with Jessie(as you said). And in that time,I’ve come to know you,well, as well as one can know someone through a blog. I’m sad for the hard times you’ve been through,thrilled for the victories you’ve had,and mostly I’m so frickin impressed with how well you do changes. And you’ve had a LOT of change come your way! As someone who often quakes in fear over any change, you remind me that it can be done. With grace. Mostly:). I always love your writing. Always cheers me up when your blog pops up in my inbox. I was heartened when you added falling in love to your list of changes over the past few years. You deserve love–we all do–but what a great add in to your mix of changes. It made me feel hopeful for my divorced and single friends. Hope is the most important ingredient for me, and one I like to spread. Thanks, Liz! You just made my day. Stay strong, mama! You can do whatever gets hurled at you! Thanks Julie! and you made mine. I like reading anything you put on here (I’m sure there is lots that gets written and deleted or not written at all and stays in your head). Very glad to think that there isn’t any major upheaval for Jess and you, touch wood. I think I know what it’s like to fall to pieces at the little things but act with unnatural calmness about the big stuff (you’ve had LOTS more to deal with though than I ever have, so let me just say: I am in awe of you. You are still standing, that’s amazing! Don’t forget that) – I think it’s to do with it being ‘safe’ to come apart over the nothing instances: the space, bagel, ripped nail, stubbed toe etc. Because we can just let go and indulge in the over-the-top “woe is me, none of this is ever going to get better, etc etc” with a crying jag or a figurative throwing ourselves at a wall, theatrically banging against it, and… err, whatever. 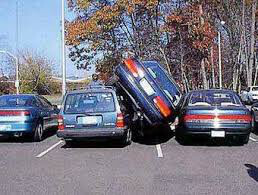 It is safe because once we’ve calmed down we can tell ourselves: oh well, it was just a parking space, no harm done. And the tears got rid of some stress hormones and we feel a bit better for it (some of the time at least). But do anything like this at a time when it matters? Oh no. We have to keep our loved ones and ourselves as safe as we can, so we’re of course gritting our teeth and soldiering through. I just don’t think I could do it as well as you do. And you don’t like changes I seem to remember you saying, you like feeling in control. And for all that you really do amazingly, astonishingly well when it matters. Life throws curve balls. I just turned 15, and with that, came so many curveballs that I couldn’t handle it. The most important thing is getting back up, that’s what I have learned. Newton’s third law states that an object in motion will stay in motion unless it is acted upon by an outside force. You are the ball that needs to keep rolling, no matter what outside forces stop you. You run an amazing blog, and it has been fun to come along for the ride, just remember, that you have a great kid, and that you will be able to make it through this with her. Peace out! You might be my favorite kid…thanks, Matt! Hi, Julie, I’ve just finished getting through your entire blog in (practically) one sitting. It’s totally the wrong time of year for this and this is the wrong post to put it on and so on and so forth, but I wanted to share this link with you for future summers before I forgot. It might make your and Jessie’s lives easier in terms of swimsuit (and maybe underwear) shopping, I hope!